Although Anderson Silva’s ears are completely congested from all the verbal venom Chael Sonnen has spewed his way, the middleweight king may want to hear what his former foe Nate Marquardt has to say. After all, he learned firsthand at UFC 109 that you can’t fall into Sonnen’s trap. The Colorado native believes his lack of movement allowed Sonnen to dominate their critical clash. Unfortunately for “Nate the Great,” the shocking upset loss cost him another shot at the brass ring. “My mindset going into the fight was, ‘I’m going to knock this guy out.’ If you go forward trying to knock a guy like Chael out, that’s where you’re going to get taken down,” stated Marquardt. “I know for a fact that my wrestling is as good as his, if not better. I just didn’t get a chance to defend any of the takedowns because he would get in so deep because of what I was doing wrong. Sonnen’s gameplan is probably the worst kept secret in all of MMA. The chatty challenger has made no bones about his intentions on having “The Spider” stare up at the Oracle Arena ceiling throughout their August 7th match-up. Silva’s thought process, on the other hand, is the true wildcard in this showdown. Will we see the same striker that embarrassed Forrest Griffin like an amateur sparring partner at UFC 101? Or will the same disenchanted champion that’s unloaded three consecutive lackluster title defenses rear his ugly head again? Marquardt’s first priority of business is ground ace Rousimar Palhares. 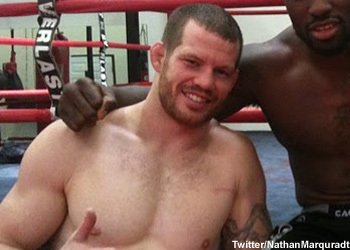 The two will collide in a pivotal 185-pound affair at UFC 118 on August 28th.